To meet hi-tech requirements and to make the students competitive in contemporary times, the highest quality computer education is imported through professional experts. A wireless LAN has been set up in the lab to encourage students to use computers to access the campus Intranet & Internet for research & communication purposes. The school is on the way to have online testing of the students. 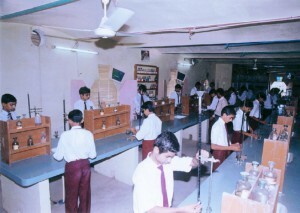 The regular theory classes and text book material are supplemented & fortified through well equipped labs of each of the three streams of Science (Physics, Chemistry, Biology),Geography lab and a unique Maths Lab so that the students practically carry out their theoretical knowledge. The labs are trendy, accoutred with audiovisual teaching aids, learning kits and the finest apparatus for conducting experiments. So the students develop observational skills & acquire knowledge & information of scientific laws & theories.